It’s not uncommon for residents to resist showering, and as therapists, we work to ease their anxieties while supporting our staff. At Northbrook Healthcare Center, we’ve implemented strategies that have proved successful in encouraging residents to participate in bathing routines and even find enjoyment in the process. We had a resident exhibiting negative behaviors, i.e., slapping staff, yelling and cursing when CNAs approached her for a shower. Documented refusals resulted in a referral to our occupational therapy department for the Abilities Care Program and our Bathing Without a Battle program. We also implemented simple changes such as rephrasing the showering task as an opportunity to “freshen up,” language to which this Southern Belle resident responded well. Additionally, we trained nursing staff to provide an alternative to bathing. In the event the resident declined a shower, she would be offered a “Bath in a Bag.” Prior to a shower or bathing task, she was also reassured that her coffee, snack and classical piano music would be ready for her in her room. Previously, this resident refused any type of shower or bath for two to three months. 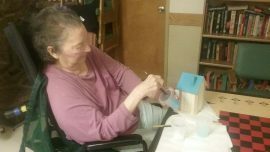 Now, the resident demonstrates 100 percent active participation and no negative behaviors. Our Bathing Without a Battle program is proving effective for this resident, and undoubtedly, for the staff helping to implement her grooming routine!